Literary Classics: CLASSICS: Why and how we can encourage children to read them, by Fiza Pathan, has earned the Literary Classics Seal of Approval. CLASSICS: Why and how we can encourage children to read them, by Fiza Pathan, has earned the Literary Classics Seal of Approval. Fiza Pathan is a school teacher and an adoring devotee of classic literature. She speaks passionately and with purpose on matters of reading. 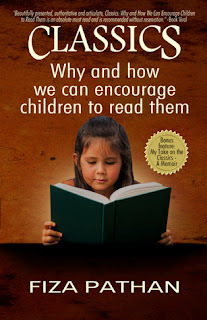 In her book CLASSICS: Why and how we can encourage children to read them, she touches on many key points in her arguments in favor of classic literature. With solid examples and sound reasoning one would be hard pressed to walk away feeling anything but inspired after reading this book. Well-written, and a quick study, this should be required reading for all educators (. . . and parents for that matter). CLASSICS: Why and how we can encourage children to read them is highly recommended and has earned the Literary Classics Seal of Approval.